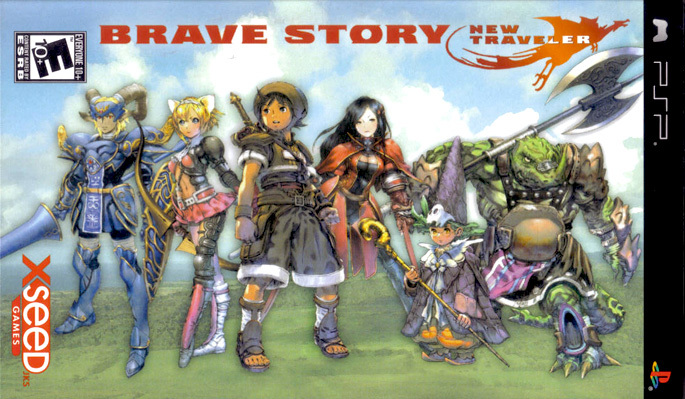 Brave Story: New Traveler is a traditional RPG title developed by Game Republic, the same team that brought us Folklore and the Genji series. While the team at Game Republic succeeded in making Brave Story accessible and easy to play, there are some crucial areas that were overlooked, unfortunately. Brave Story is loosely based upon a Japanese manga series of the same name. The story begins with a boy named Tatsuya sitting on a bench with his PSP (I kid you not), happily ignoring his lady friend, Miki, who simply wants him to pay attention to her. Art imitates life. After Miki gets fed up and ventures off on her own, Tatsuya ends up finding her on a random street, apparently in a coma. You can actually rename both characters at the beginning, but be wary of a glitch that adds spaces to the end of your names. It ruined the dialogue for my entire play session. After a talking frog offers Tatsuya a chance to save Miki from certain death, he ends up in the fantasy world of Vision. While most of the game takes place in Vision, there are a few chances to revisit the real world, albeit through in-game cinemas. Before being granted access to Vision, there are a few trials that end up affecting different aspects of your character’s abilities, such as strength, agility, and defense. Though this section is a bit convoluted at first, it’s a nice touch that personalizes your character. 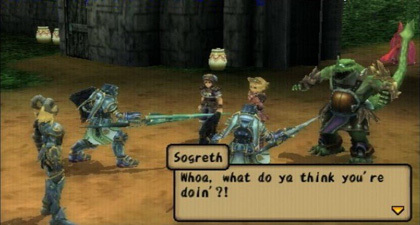 This PSP title will feel familiar to anyone who’s played a JRPG during the past 15 years. Jars and chests filled with rare items litter the environment, combat requires everyone to be polite and take turns hitting each other, and any character that looks suspiciously well-detailed is destined to end up joining you on your epic journey to save the world. Though the game takes a few hours to pick up speed, the developers definitely went out of their way to make sure the player never gets lost or confused. Item shops and inns are marked with emblems for easy reference, dungeons are separated into nice-sized chunks and even include directional markers, and the R button reiterates the specifics of your current mission, which helps if you stop playing for a few days. 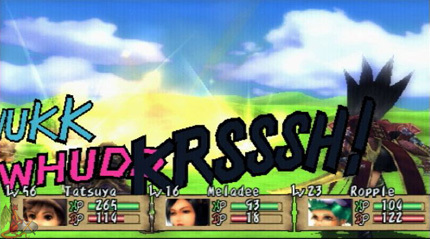 Brave Power (BP) is the main focus of the battle system, and acts similar to MP in that it controls the usage of magic spells, such as healing or remedying status effects. But BP also controls the usage of high-powered physical attacks, which are identified as Bravura Skills and Unity Skills. The two skill types are identical, except that Bravura skills are solo attacks, while the Unity Skills require multiple party members. 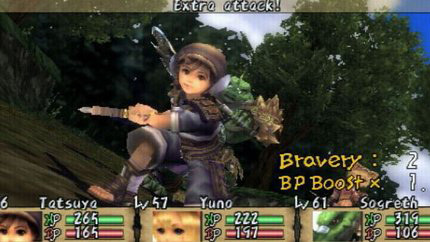 BP is obtained by either dealing damage to enemies or finding Healing Points in the environment. The cool thing about Unity Skills is that while BP is taken from each party member involved in a Unity attack, only one character turn is used. So if your BP meters are high enough, your party can deal three to four times the normal amount of damage seen in a normal turn. This ends up making boss battles a lot easier, and even acts as an alternative to dealing with particularly tough enemies. The ability to create your own accessories to boost character abilities, or add new ones, does add quite a bit of depth to the title. For instance, I built Leech Rings for all my party members, which allowed them to receive HP for each attack they pulled off. This ended up taking a lot of weight off my mage and freed up valuable BP for more Bravura and Unity Skills. The flipside, however, is that the creation of these accessories requires a thorough investigation of every town and dungeon, as well as completing some side missions. In addition to this, raw items obtained through killing enemies are required to create these accessories. Accessories make the game lot easier, but only if you’re willing to explore every facet of the environment and play through random battles for hours at a time. The graphical quality is impressive for the most part, and Brave Story manages to stand toe-to-toe with mid-range PS2 titles. Character and enemy design is extremely well done, and the models look great; the environments though are often a mixed bag. The smaller environments generally look very good, but the larger areas tend to suffer from repetitive texture work and a lack of polygonal detail. This is more evident during cinematics. Also, the art direction for a few of the environments is downright horrible. For example, the old Triankha Hospital has vines covering every visible surface, but it’s simply applied as a texture map instead of being physically modeled. This ends up making the level look grainy instead of dilapidated, as well as aesthetically boring. This doesn’t occur very often, but when it does the immersion level takes a big hit. Thankfully, load times are pretty much non-existent. The sound design during battles is great, and in conjunction with the fancy camera work and comic-style exclamations, the game really comes to life. Strangely enough, this doesn’t carry over into the exploration segments. Except for the MIDI tunes playing in the background, the environments are freakishly silent, regardless of how many people are onscreen. What compounds this situation even more is that voice acting is completely absent outside of battle, save for a handful of cinematics. All dialogue is performed through on-screen text, and what’s worse is that Tatsuya NEVER SPEAKS. Without any thoughts, quips, or opinions, he ends up falling flat. The other characters are actually very dynamic, which makes me wonder whose brilliant decision it was to make the main character mute. While Brave Story: New Traveler doesn’t have any gameplay hindrances, it also doesn’t attempt anything particularly unique or exciting. The Bravura and Unity skills make the battle system enjoyable, but the story and exploration aspects of the game are as clichéd and boring as RPG games get. The Accessory Building system itself only involves collecting items, whether it’s the raw materials or the instruction pages required to build these items. The bird catching mini-games are a nice distraction, but require pure luck to win. The real problem with the game is inconsistency. If every aspect of the game was well thought out and properly implemented, it would have been a very enjoyable experience. But as it stands, certain aspects of the game are done very well while others are just sloppy. With enough work, this could have been a worthy competitor to Dragon Quest or Final Fantasy, but just isn’t brave enough to break out of the confines of its genre and become something truly great. Brave Story: New Traveler is still a pretty good game for adolescents or those who love SNES-style JRPGs, but for those wanting more, look elsewhere. Great art style, generally good graphics. Overall game quality isn’t consistent. Great combat system, but exploration is a mixed bag.